A former employee of Michael Douglas has accused the Oscar-winning actor of sexual harassment, saying in her first television interview about the allegations that Douglas made her feel "very uncomfortable." Writer Susan Braudy worked at Douglas' production company for three years in the 1980s, when he was staring in critically acclaimed movies like "Wall Street" and "Fatal Attraction." She told the "Today" show that he would make sexually suggestive comments toward her and once began to "fondle himself" in front of her. "He thought he was the king of the world," she said, "and that he could humiliate me without any repercussions." During a 1989 meeting in his New York apartment, Braudy claimed Douglas "unbuckled his belt and put his hand inside his trousers." "I could see what he was doing, and then he began to sort of fondle himself," Braudy said. "And I was very scared." According to NBC News, Braudy described the meeting as "very uncomfortable," adding that she "knew things weren't supposed to be this way." She then "ran for the door." The writer, who has been published in The New York Times, Newsweek and The Atlantic, said on "Today" that she told friends at the time about what happened but was urged not to speak publicly about the incident out of fear of retribution. "People were very frightened for me," she said. "I made sure that I was never ever ever alone with him again," Braudy added, according to NBC News. "It became a very hostile work environment for me." Braudy also detailed the verbal harassment she said she experienced from Douglas, according to NBC News. "He would repeat things that he said to Jack Nicholson, who he loved to talk to on the phone about such things as the 50 slang words for his private parts," she said. Braudy added that Douglas would make "so many comments about my body and how I would be in bed," leading her to "wear layers of black clothing so nothing would stimulate him." She said Douglas would comment on her new clothes by laughing and saying, "Why are you dressing so much like a pregnant nun? What is it with you?" 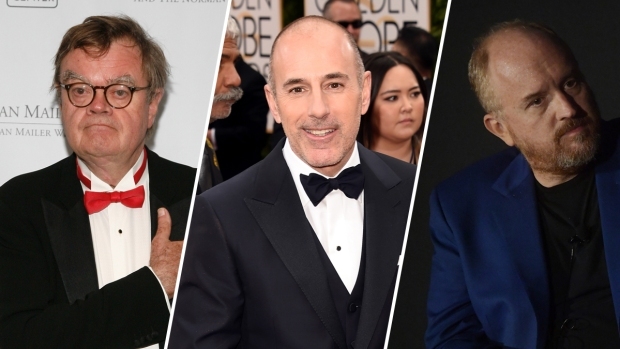 Douglas did not return NBC's request for comment, but he told The Hollywood Reporter that Braudy's claims are "an unfortunate and complete fabrication." "This individual is an industry veteran, a senior executive, a published novelist and an established member of the women's movement — someone with a strong voice now, as well as when she worked at my company more than three decades ago," Douglas wrote in a statement to the publication. "At no time then did she express or display even the slightest feeling of discomfort working in our environment, or with me personally. That is because at no time, and under no circumstance, did I behave inappropriately toward her." He also suggested to Deadline that Braudy is perhaps "disgruntled that her career didn’t go the way she hoped and she is holding this grudge." However, Braudy disputed that to "Today," saying that she repeatedly complained while working at the company.